DIY Christmas ornaments are great stocking stuffers or inexpensive gifts for the holidays. Here is a collection of DIY Christmas tree decorations. The weather is getting cooler and Christmas is around the corner. DIY ornaments take some time to make, so its best to get started early before the holiday rush happens and you can’t fit in the time for these awesome crafts. If you’re handing out your ornaments as gifts, these craft boxes are great for wrapping. These adorable ornaments use your child’s thumbprint which will make a great keepsake to take out each year. 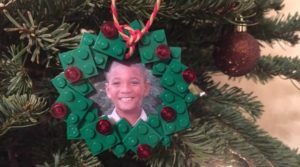 Have a LEGO obsessed kid in your life? Get them in the Christmas spirit with this ornament. 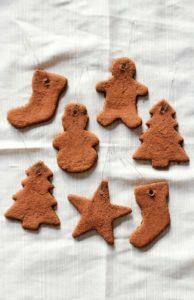 Only two ingredients – these easy ornaments are simple enough that kids can join in on the fun. Yellow isn’t a typical Christmas color, but after seeing these I don’t know why! They will pop against the green tree. Have wine corks around but don’t know what to do with them? 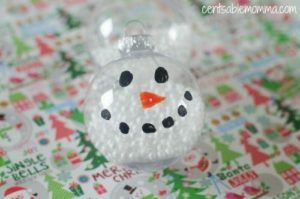 This adorable snowman craft is the answer. Snowmen are such a holiday staple – this simple DIY snowman is adorable and easy. Start collecting those pinecones! Change up the glitter color to match your tree theme. Do you have a favorite DIY Christmas Ornament? Share in the comments.